This High Definition Multimedia Interface HDMI cable interfaces between any audio/video source with HDMI. This includes set-top boxes, DVD player, game consoles, A/V receivers and/or video monitor, such as a digital television (DTV). HDMI® supports standard, enhanced, or high-definition video, plus multi-channel digital audio on a single cable. It transmits all ATSC HDTV standards and supports 8-channel digital audio, with bandwidth to spare to accommodate future enhancements. 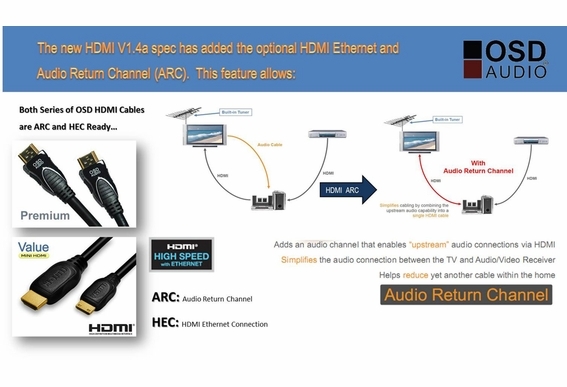 Discover the Difference HDMI Makes! Today’s game consoles like XBox 360 and PlayStations with HDMI inputs are an excellent way to see the true impact HDMI makes. If you’re using the standard RCA connection that comes with the console and have that connected to your HDTV, switch to an HDMI cable. You will be floored by the difference in graphics, even on an older 720 HDTV. Images are pin-point crisp, so real you feel like you’re being drawn into the action. 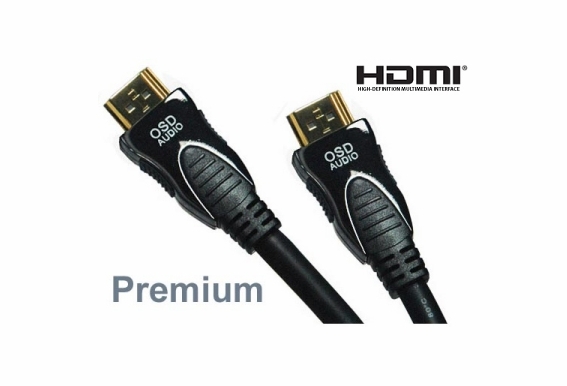 HDMI is amazing and OSD give you a chance to see the diffence for a fraction of the price! 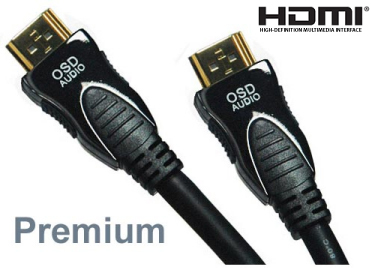 Made for 3D TVHDMI (High Definition Multimedia Interface) is a pioneer in the digital transmitting cable family. 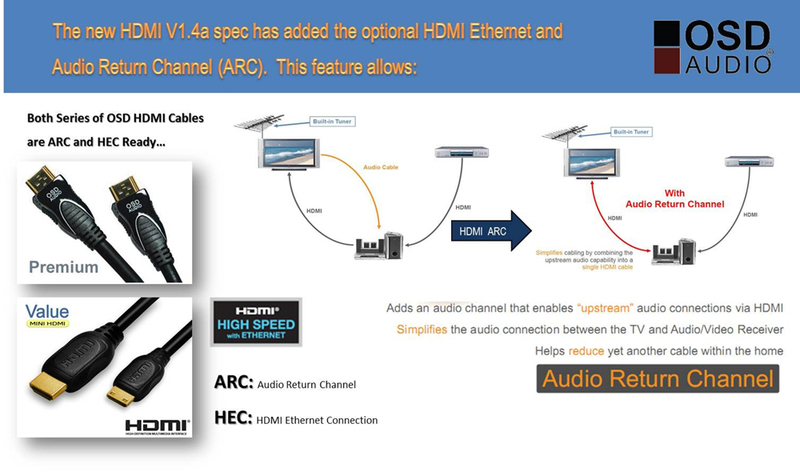 Combining video and audio into a single digital interface, HDMI is building on the features and benefits of DVI, while adding new capabilities and maintaining full backwards compatibility. Our HDMI cables transmit frequencies up to 10Gbps. They transmit high quality multi-channel audio data and even support all standard and high-definition consumer electronics video formats. They also transmit control and status information in both directions. With a compact interface, HDMI can transmit higher quality digital video signals (10/12bits) and supports digital audio frequencies including DVD-Audio. HDMI is widely used for transmitting signals from set-top boxes, HDTV and other audio visual sources to television sets, projectors and other video displays. Is this meant for outdoor use? We bought a HDMI, 3D, 55 inch TV. is this the cable that I want to buy to hook up the cable box, blue ray player, wii, and surrond sound? What is the Bandwidth for your 9ft Premium High Speed HDMI Cable with Ethernet? How does 17.8 gbps compare to 10.2 gbps? Can your cable do everything a Monster 900HD with 17.8 gbps can do? 1. What is the broadband for your 6'-0" & 9'-0"? 2. Do they both have arc?